I'm linking up with the pleated poppy's What I Wore Wednesday(wiww) again for some fun. 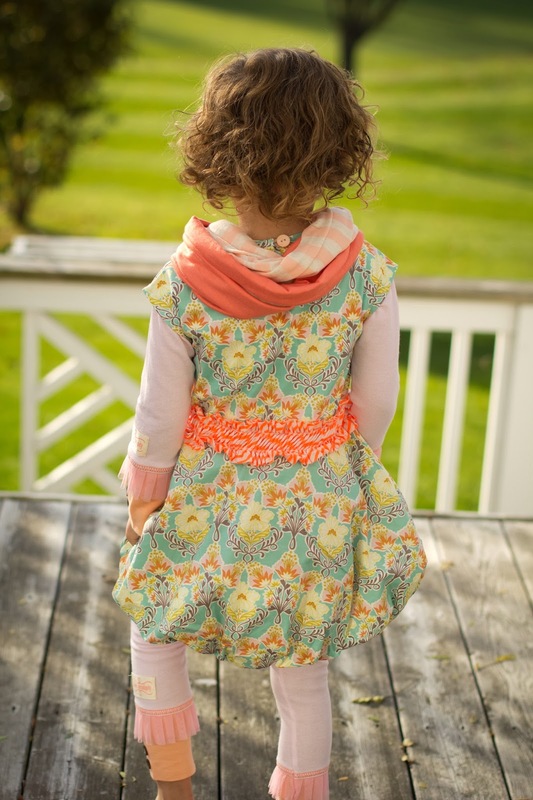 And there's a massively adorable giveaway today from Sweet Serendipity Clothing. Find out details about this dress and how to win it below. I've reached this weird place in life, almost 40. When my mother was almost 40 I was a teenager, she was divorced and starting over and over and over. I look back now remembering my neighborhood of 40-something parents divorcing, some men driving up the driveways in new red convertibles (some could afford them and some seriously could not), leaving careers, marriages and identities in the dust. And now that I'm almost 40 I get it. I don't want to leave my marriage and I am in the category of seriously not being able to afford a new red convertible, but I get it. I get this feeling of change and time and aging and moving on and taking chances and going for it and starting new adventures. Some people, like my mother, have no choice but to start over because of life circumstances or husbands moving out. Other people are pushed by some powerful force (or maybe it's all about the hormones). For some people it's about taking risks with fashion. Like pink hair. Last minute decision, pink hair for the Pink concert. The hair was courtesy my daughter's hair chalk from Walgreens. I like to call this my Like A Prayer Shirt. Dating myself again, I know. I bought it from a local boutique and lo-lo-love it. For a lot of us, our babies aren't babies anymore. We are re-evaluating, re-examining. Going back to work or going full-time or going part-time. Some of us are looking for jobs (Jo-Ann Fabrics did not hire me even after my impressive resume) and new careers. Even though Jo-Ann Fabrics didn't hire me, I did find a job. One day a week I am an office assistant for a very nice woman who runs a business out of her home. So it's not really an office, but it's the most office'y place I've worked in a decade. It's not something I really love. It will do for now and provide a little extra money to save up for my convertible. Or new clothes. Or more realistically my kids' sports. some of us had mixed feelings. Maybe it's the new job or the new identity stuff or my obsession with songwriters of the 70s and 80s, but I keep thinking about Carly Simon's song from the movie Working Girl (I know it's so old, but so am I!). Remember? "Let The River Run"
I mean come on! This is my new/old, mid-life, almost-40 anthem. This whole hormone, bigger-than-me power that is pushing me toward change isn't a bad thing. It's an all mixed-up thing. It's scary, exciting, nerve-wracking, confusing, reaffirming, empowering, humbling and a million other "-ings." If you have a dream, you need to give it a shot, if not now, when? One of my favorite quotes reads, "Regret for the things we did can be tempered by time; it is regret for the things we did not do that is inconsolable." That quote is attributed to Cristina Bishop. Cristina, the designer of the dress pictured above and below, always loved fashion. She said it was a passion of hers since she was 7 years old. "While my mom sewed, I would create things out of her fabric scraps," Cristina remembered. She grew up, got a degree in clothing design and worked as a clothing stylist and personal designer. Cristina also had a women's clothing line featured in the Detroit Apparel Center. After having kids, her focus changed from women's clothing to children's clothing. And she and her husband decided to go into business together. "My husband started the company [Sweet Serendipity Clothing] and I lend creative inspiration to the designs," she said. The company launched its first collection this Fall. When asked what her plans and/or dreams are with their business she replied "To continue to add value as the creative force behind Sweet Serendipity Clothing, and to inspire as many little girls as possible to follow their dreams." Isn't she pretty inspiring? I think she's all kinds of ahhhhmazing. Guess what else is ahhhhmazing? You can win one of Cristina's beautiful designs. Leave a comment below and one lucky winner (chosen randomly on Monday) will win a Don't Burst My Bubble Dress in any size from 2-8. 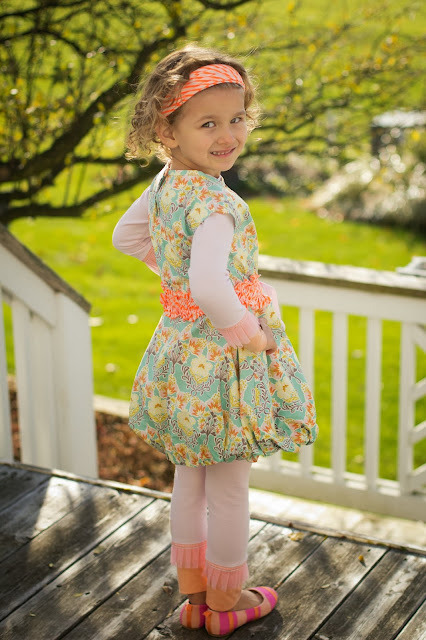 Pictured here on the blog on this adorable model, the dress retails for $84. "It feels wonderfully satisfying to see what started as just an inspiration, take the shape of a garment. And then to see a little girl smiling from ear to ear as she twirls in her Sweet Serendipity Clothing...that's the icing on the cake," said Cristina Bishop. So, leave a comment! Tell me what your dreams are, give advice to all of us almost 40-year-olds, reveal what your mid-life crisis anthem is and/or a recent fashion risk you took. Share and you could win! I will pick a winner randomly from the comments on Monday. 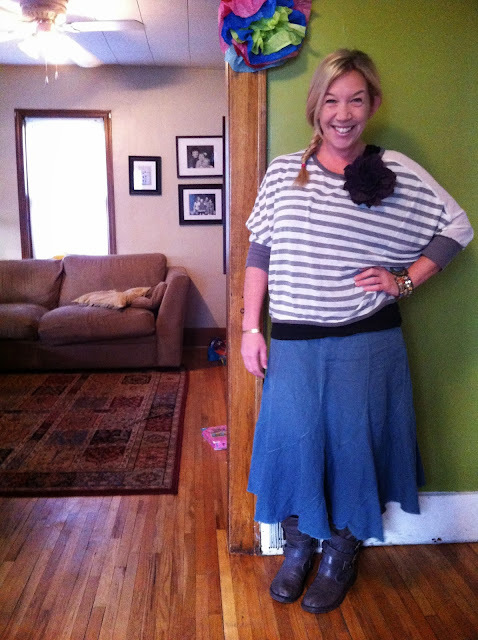 Be sure and check out Cristina's other beautiful clothes on the Sweet Serendipity Clothing site. Most recent fashion risk: ignoring the corporate dress code and wearing a denim jacket as part of my office attire not two but three days in a row. Once I embellished with a felt flower, similar to your flair here. Another time I wore it over a black dress (and removed the jacket when I went into a corner-office meeting). I understand dress codes but as a 40-year-old who doesn't like being told what to do, I don't always embrace them! Congrats on your new job !! Right now I am a stay-at-home mom during the day and I work part-time at night. When my kids are school-aged, I would like to go back to teaching elementary aged students. I recently read a quote by writer Ann Voskamp: "What if the question wasn't what are you so grateful for? BUT How are you changing the world because you are so grateful?" I love this quote and hope it becomes relevant in my life as I navigate my way toward 40! As a fellow almost-forty-year old, I think 40 is the new 40! :) I'm learning -- determined -- to embrace my age without worrying that an impending birthday could hold me back or push me into a rut. My dream/hope is to never be "comfortable." I want to continue to be challenged and serve others doing things that might be out of my comfort zone. Here's to new adventures! Girl, right there with you but I am 42! My DD started half day kindy and I started working one afternoon a week as an assistant preschool teacher. I am petrified to go back to the real world but having a taste of it is also exciting. How will I balance, how will give my family and a job the appropriate attention after only giving it to my family? Sooo, sooo many fears and ifs.... I love that Cristina took a chance and followed her passion. Lately, my biggest risk has been wearing color! Baby steps...Thanks to you both for the inspiration. I'm passed my 40's, as I am 52, but I would do it all again in a heart beat! I feel the 40's are the new 20's and the 50's are the new 30's. I by no means feel my age other than my achy body after a long day at work. I don't feel I dress or act like a typical 50 yr old, at least not the way I remember my Mother at that age. I love the dress that you are giving away and would like to win it for my grand daughter! She is bi-racial and has the perfect skin coloring for it! I am enjoying my age as I feel I can enjoy my grand children much more! Current fashion risk - being 6 months post partum after having 3 kids in 2.5 years and attempting anything without a stretchy waist :) It's all a debacle - but hopefully will improve soon! In the meantime I will embrace maternity jeans for as long as I can. I love the dress, adorable! I'm not sure about a big fashion risk that I've taken but I really want a pair of cowboy boots which is totally out of my comfort zone :) Maybe I'll put them on my xmas list! I LOVE the SS clothing line, so soft and pretty. You should totally get cowboy boots! You are right the SS line is so soft and pretty. I lvoe your Like a Prayer shirt, and the pink hair! I so wish I could've gone to see Pink...I bet that was a great show. Joann should've hired you. What is HER deal?? 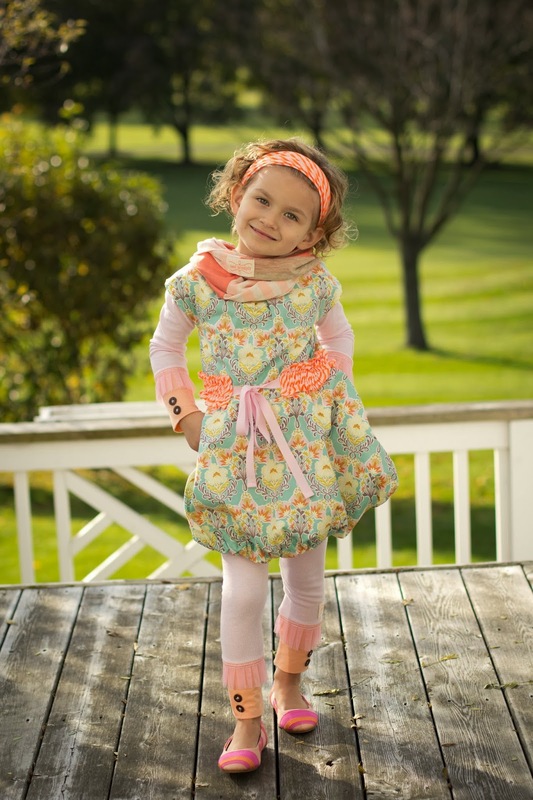 Also, that dress is so stinking adorable, as is the little model. Ha! Ha! I know how COULD she? Joann, come on! I agree that model is such a cutie.